Stim Therapy, or "Stimulation Therapy", is a pain treatment and/or helps to relieve muscle spasms by electrically stimulating the muscles of the area of the body affected by pain. This mimicks the natural stimulation of the muscles that occurs from exercise. Dynatronics has combined the popular features of the Solaris Series with revolutionary Tri-Wave Light to create the innovative Solaris Plus Series. Solaris Plus offers the most options in any one device by including patented 3-Frequency Ultrasound, 7 Stim waveforms, and the option of adding Tri-Wave Light Therapy. Exclusive Target and Target Sweep are still standard, allowing interferential treatment to be moved directly over the center of interference. Solaris Plus is covered by a 2-Year Warranty and backed by the best customer service in the industry. Solaris Plus delivers 7 Stim waveforms including IFC, Premod, Biphasic, Russian, High Volt, Microcurrent, Direct Current, and Fixed Frequency IFC/Premod. In addition, Solaris Plus offers 3-Frequency Ultrasound and the new Tri-Wave Light Therapy. Best of all, Solaris Plus has the power to deliver up to 5 channels of Stim, Ultrasound, and Tri-Wave Light Therapy through both Probe and Pads—all at the same time. Deliver any combination of 3 wavelengths of light (red, infrared, and blue) using the Tri-Wave Light Probe or 2 robust 5” x 7” Tri-Wave Light Pads. Dual Light Pads allow for greater coverage of a joint, treatment of 2 separate areas simultaneously, and the ability to treat large areas of the body when placed side by side. Even with nearly unlimited flexibility, setting up a treatment has never been easier. Some treatments can be set up in as few as two key presses. Treatment parameters are highly visible, easy to read, and changed at the touch of a fingertip. The only Ultrasound devices in the industry offering 1, 2, and 3 MHz frequencies for the greatest flexibility in depth of treatment. Purchase of a Solaris Plus 709 (D719) or a Solaris Plus 708 (D718) includes a choice of one of the applicator soundheads. 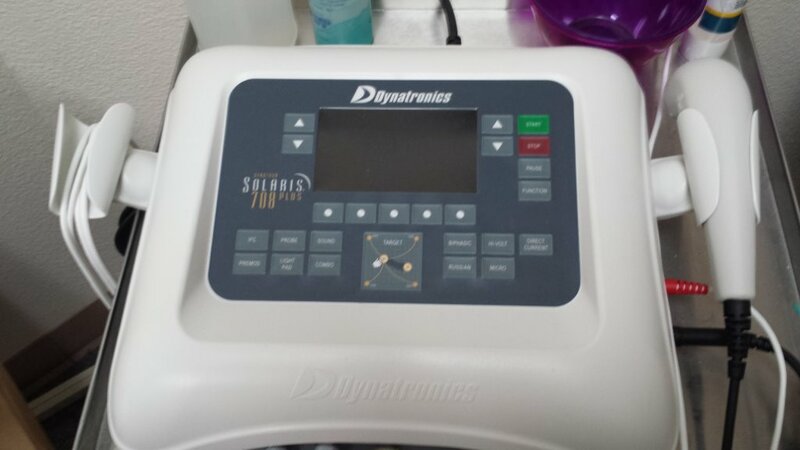 By focusing the treatment precisely where it is needed, Dynatronics’ unique TARGET feature provides a more effective interferential treatment on all Solaris Plus devices. Simply glide your finger across the TARGET touch pad to move the center of interference to the site of your patient’s pain.